[miningmx.com] – THE flight from gold amid expectations of rising rates and a stronger dollar have to some extent masked the impact of AngloGold Ashanti’s aborted rights issue and de-merger strategy on the gold firm’s share price. The share was already under pressure from September 1 losing about 7% over seven days as the dollar gold price sank – now down to its lowest levels for the calendar year . On September 9, however, it shed 15% as investors took a dim view of the $2.1bn rights issue proposal. It regained ground by September 15 when the de-merger was formally rejected by management, but has since fallen another 4% as the pressure on it and all other South African gold stocks has intensified. Not even Harmony Gold or Sibanye Gold, which have seen the rand gold price strengthen whilst the dollar gold price has fallen 6% this month, have been immune from the selling. “I don’t anyone thinks the gold sector has been over-bought, there is just negativity about the outlook with most people expecting a stronger dollar, with rising interest rates but with no real inflationary pressures,’ an analyst said. “Investors are obviously concerned about cash flows and future impairments. And there are quite a lot of redemptions from funds,’ he said. It’s in this environment that AngloGold must set about piecing together its new “old’ strategy, reducing costs (where possible but which must be increasingly difficult) and selling assets to relieve pressure on the balance sheet. For CEO, Srinivasan Venkatakrishnan, this must be a particularly trying time. One US fund manager said it was not beholden on Venkatakrishan to win back some lost prestige following the rejected demerger. “Venkat had an excellent reputation that now will require fixing,’ he said. The demerger proposal was, in his view, a “value neutral event’ although the conditions foisted on AngloGold by the South African Reserve Bank will only increase the perception that the country is not investment friendly. Asked in an interview whether he viewed it as a knock to credibility, Venkatakrishnan acknowledged the impact. “It’s a setback. We were thinking 10 years ahead, but it’s also not a do-or-die’. On the upside, the rejection of the demerger also revealed comfort among investors with the current strategy. “They said it’s not like we have our back against the wall. They said “we like what you’re doing’,’ said Venkatakrishnan. What’s obvious is the need for more balance sheet surgery. The proceeds of the $2.1bn rights issue would have helped cut net debt to about $1.5bn including much of a 2020 corporate bond Venkatakrishnan negotiated which at 8.5% contributes to total interest costs of $250m a year. That’s heavy or as Venkatakrishnan describes it “… higher than we would like’ given the high interest rate environment and low gold price. What’s then likely is for AngloGold to accelerate the sale of its Ghana-based Obuasi mine, an operation currently on care and maintenance as the company sets about “right-sizing’ it. The asset, bought in 2003, has never lived up to expectations but no-one has had the cajones to take action until now. Venkatakrishan may also decide to joint venture the asset and possibly do the same with the firm’s Colombian development projects. There’s also the possibility AngloGold could take another, lower rights issue back to the market. 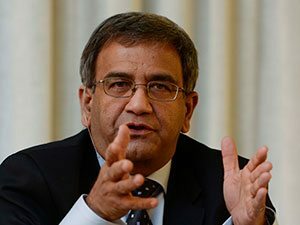 “Our calculations imply that even with the current improvement in efficiencies, AngloGold Ashanti’s All In Cost free cash flow plan for the 2014 financial year returns break even at a gold price of $1,300/oz when finance chargers and taxes are included,’ said Standard Bank Group Securities. “We therefore believe that any significant quarter-on-quarter debt reduction is unlikely at the current low gold price and mine efficiencies. Therefore, a smaller equity capital raising (about $1bn) in the form of a rights issue cannot be ruled out,’ it said.